..so they dance! : Mini-reviews, part saat (7). Born out of a realization that August is soon over and I've barely posted, must correct quick quick quicccck. 61. Dil Chahta Hai (2001) - Surprise surprise, friggin' love this movie. It's fun, it hasn't got old for me so far, filled with actors whose work I enjoy to say the least, solid writing. There's a reason why DCH, a story of three friends, their loves and losses, is heralded as influential and ground-breaking. Previously discussed here. 62. Bluffmaster! (2005) - Wow, hard to believe this film is five years old by now. It may be half-based on a Hollywood film but it is nonetheless a great contemporary Hindi comedy and features solid performances by all leads (Abhi, Riteish, Boman - okay, given, I'm not the biggest fan of Priyanka here). If you haven't seen it already, by all means do, because it's not as talked about anymore and I don't want people to miss out on it. 63. Mission Kashmir (2000) - It puzzles me how this is one of the few films released on Region 2 DVD.. I mean, it has some good bits (Preity-Hrithik love story, some songs) but overall it is kind of a tragic wasted opportunity. The melodrama here just didn't gel for me. As this and Eklavya are the only VVC directed films I've seen, I'm afraid I don't really believe in him as a director. He's better off producing. 64. Black (2005) - I try not to be too vocal about my dislike of Sanjay Leela Bhansali, he's just one of those directors where your mileage may vary and my mileage wants nothing to do with his mileage. But I got into Bollywood actively in '05 and this film was all the range back then so I felt I had to see it. Yes, Rani gives a good performance. Yes, Amitabh is effective. And that's about it, for me. I can be into films like this ..just wasn't into this one. 65. 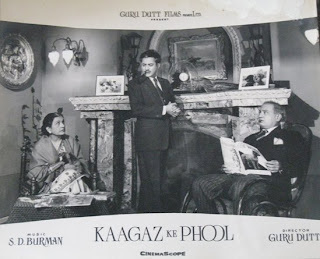 Kaagaz Ke Phool (1959) - This is the only Guru Dutt movie I've really liked but yet don't own. It's a gorgeous piece of film making, deserving of its reputation but I guess the hopelessness of the storyline made sure I didn't think I'd want to rewatch. This was years ago, though, now I am beginning to reconsider. Guru Dutt posesses a strange magnetism on-screen, even when his characters do dubious things, you root for them. It's quite a wonder. 66. Veer-Zaara (2004) - First time I saw this Preity-Shahrukh starrer? I loved it to death and found it beautiful and glorious. Second time? It was fun but maybe a tad dull. Third time? Made me wonder why the hell I was watching it the third time, all the flaws were more apparent to me than ever before. I am not sure what turned it from an epic love story I enjoyed to a dull film me and my friend ended up cracking jokes during but whatever, so that happened. I'd still recommend it to newbies desiring a dreamy, over-idealistic love epic ... but that's about it. 67. 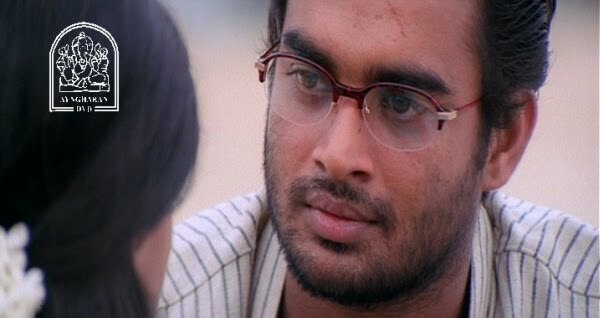 Kannathil Muthamittal (2002) - Despite the annoying Ayngaran Video logo plastered on the copy I watched, this Mani Ratnam Tamil film was quite an enjoyable cinematic ride. Especially the adult leads, Maddy (with glasses!) and Simran, were a treat. To be quite frank I've forgotten if I had any other complaints than the fact the child actor was annoying.. but I still wouldn't steer people away from this movie. It's a good 'un. 68. Teesri Manzil (1966) - So this is like a massive classic and people love this and people love Shammi Kapoor and it's facts like that make me really apologetic about how underwhelmed I was by this movie. It's a pretty good 60's film noir/detective mystery type of film but I just wasn't too fond of it, or of Shammi. Mujhse maaf karo, Memsaab! 69. Chak De! India (2007) - It's a feminist sports film with an awesomely script that portrays a great variety of interesting female characters. What's not to love? Plus it's just a solidly directed film that doesn't get old on rewatches. Oh and there's some dude with a beard, but who cares. Hockey, yay! I've discussed the film before here & about its feminist character portrayal here. 70. Hum Tum (2004) - Oh it's just this film with two ultimate favourites (a label that Rani holds strongly onto but Saif is sadly slipping from..) by a favourite director that I've seen closer to ten times by now. And it's my favourite film genre (romantic comedy) and its flaws I can easily forgive (the animation, what the heck!). So yeah. Is it a favourite? You bet your bottom rupiya it is. Previously discussed here. See you in September, I promise I'll be better. I'm with you on Veer Zaara, it just kills me everytime with that cheesy 'all mothers are the same' dialogue that SRK utters. I remember it released on my birthday so I was doubly happy but on the fifth viewing it was a really gorgeous pile of cheese! And I loved Kannathil Muthamittal, which was my first Tamil film after the waaaay too depressing Sethu with Vikram! 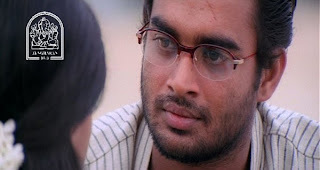 Kannathil Muthamittal Was my first Tamil film. I loved it! It made me fall in love with Maddy too. I loved Bluffmaster too! Sadly, my parents didn't like its charm... 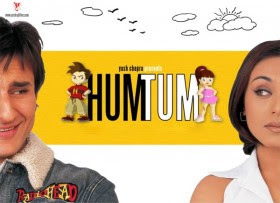 I need to see Hum Tum. Rum - VZ definitely has some good points. I still adore some of the soundtrack. I so agree with you on Veer Zaara...and I didn't even like it on my first viewing - cheesy, but not even in a good way (this coming from a SRK pagali!). DIL CHAHTA HAI!!!! I still love that one, too! Well its 30th September and your no better - you broke your promise! I feel betrayed! I agree about your dislike of the two Vidhu Vinod Chopra films Eklavya and Mission Kashmir. But hes also done Munnabhai series and Parineeta - you loved them didn't you? Subramaniapuram - the other side of the fence. Latest from a smart, funny individual! The end of blogging hiatus.